The Australian Government has announced that it is investing $10 million to encourage Australians to participate in the National Bowel Cancer Screening Program. Research has indicated that 90% of bowel cancers can be successfully treated through early detection. However, bowel cancer often does not show symptoms, even when it is at a later stage. Australia has one of the highest rates of bowel cancer in the world. A recent global study published in the International Journal of Cancer estimated that bowel cancer deaths in Australia will rise by 60 per cent by the year 2035. 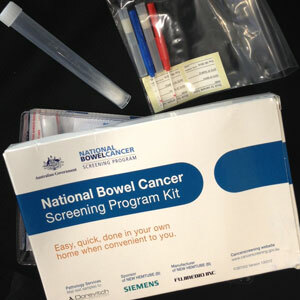 The National Bowel Cancer Screening Program is free for all Australians aged 50 to 74. The current participation rate is 41 per cent – it is estimated that increasing the participation rate to 60 per cent could save more than 83,000 lives by 2040. The $10 million investment will go towards an advertising campaign in partnership with the Cancer Council to encourage create awareness about the benefits of early detection, prompt diagnosis and treatment.